We saw something shocking on social media yesterday, and it made us want to take immediate action. Santa Claus posted that he’s thinking about getting LASIK eye surgery! So, we are asking every man, woman, and child to take up our cause. If you believe in Christmas, if you have a heart, if you’re not a humbug, please purchase a pair of these Santa Claus Rectangular Glasses and we’ll send a collective message to the big guy that we won’t stand for this kind of change. Think of it as a costume petition, if you will. If everyone starts wearing them, maybe Santa will see that needing readers isn’t a bad thing; certainly not worth crushing the hopes and dreams of people all across the globe. Think about the ramifications of a glasses-less St. Nick: every Christmas book will need to be re-illustrated; every Christmas film will need re-editing; every dad and grandpa across the U.S. will have to adapt their Santa-dressing routines to new regulations. It will be mass chaos. So we beg of you: stand with us this holiday season. Wear these iconic glasses and create a movement. Tell Santa we will NOT accept corrective eye surgery. The future of Christmas rests on your nose. Glasses were great. Comfortable fit. Great look. Had other Santa's wanting to borrow them. These glasses don’t sit properly on the nose as pictured, came extremely bent and are not worth $5. Don’t waste your money! I'm sorry those didn't work out, if you need to return them just reach out to Customer Service and they can help you out! Way too small. More likely for a small child. I'm sorry you weren't happy with these, if you would like to return them just reach out to Customer Service and they'll take care of it for you! Yes, this is the perfect final touch to that Santa costume. 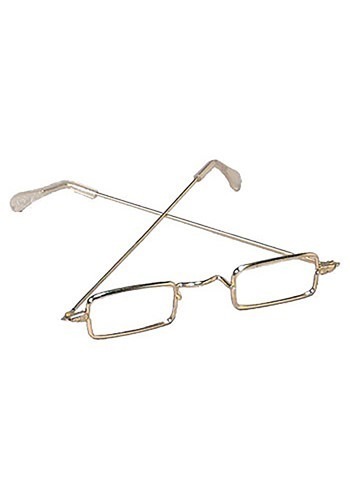 The glasses are good quality - durable - and sharp looking. The older style really compliments any Santa costume and lends it more a touch of believability. Definitely pleased with my pair - may have to get a few more to give to other Mr. and Mrs. Santas I know.